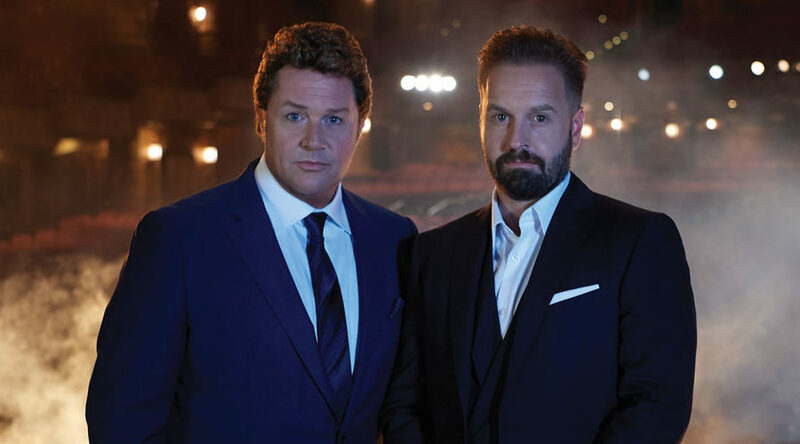 Get ready to meet two amazing voices, Michael Ball and Alfie Boe live at City Center this May. Read about the show on the 23rd of May at the New York City Center, tickets on the show and famous careers of these two singers. Both, Michael Ball and Alfie Boe have received countless prestigious awards, record-breaking sales, and chart successes throughout their long and productive careers. Michael Ball had leading roles in such famous works as the West End transfer of Hairspray, The Phantom of the Opera, Les Miserables and others. He is also a two-time recipient of an Olivier Award. Boe most recently held the lead role in Finding Neverland and Les Miserables on Broadway and shared a Tony Award with the ensemble cast of Baz Luhrmann’s revival of La Bohème. Their album ‘Together’ was the top selling UK release of 2016 and went on to become the Christmas Number 1. ‘Together’ is a compilation of musical theatre and popular classics including a Les Miserables medley, “Somewhere,” “Music of the Night,” “When You Wish Upon a Star,” “You’ll Never Walk Alone,” “Speak Softly Love” (theme from The Godfather), “For Once in My Life,” and many more. In May 1992 he represented the United Kingdom in the Eurovision Song Contest, with the song “One Step Out Of Time.” He took the second place. Following his success in Eurovision, Michael released 18 albums in the last 13 years. He also did several tours throughout the United Kingdom. In 2004, Michael traveled to Australia, where he did five sold-out concerts. He followed that tour with his first concerts in the U.S., in Salt Lake City Utah. In October of 2004, he reprised his “Alone Together” show in the Theatre Royal, Haymarket, as part of their “Singular Sensations” series. 2005 has been an interesting, active year for him. In February, he unexpectedly returned to the London stage in Andrew Lloyd Webber’s new musical “The Woman in White.” He stepped into the role of Count Fosco. After a month-long concert tour throughout the UK in early summer, Michael went into the recording studio to record his 19th CD, titled Music. In September, he made his New York City Opera Debut in their production of Gilbert and Sullivan’s “Patience” at Lincoln Center, playing Reginald Bunthorne. In November, he returned to Broadway after a 15-year absence, playing Count Fosco in the Broadway production of “The Woman in White”. Even when he was a child Alfie Boe dreamed of a career of a singer. Having conquered the world’s most prestigious opera stages, led the cast of Les Miserables for nearly a year, and stolen the show at the Queen’s Diamond Jubilee Concert at Buckingham Palace, he has certainly succeeded. Always striving to bring good music to different audiences, after three sold-out UK Tours (including the Royal Festival Hall and the Royal Albert Hall), Boe has hundreds of thousands of fans, having achieved Platinum album sales in the UK, and four top ten album placings. Alfie continues to impress, even outside the concert hall and recording studio. Earlier this year he appeared on our small screens, starring in ITV’s biggest programme of the winter, Mr. Selfridge, as music-hall singer Richard Chapman, and last year saw the release of his best-selling autobiography, My Story. Yet amid his ever-increasing celebrity status, Alfie will always be part of the classical world – he was recently awarded with a Fellowship of the Royal College of Music. Music is Alfie’s first love, and this album reminds us why he is loved in return. Britain’s favorite tenor brings us the magic and romance of the Italian Riviera with the release of his eagerly-awaited new album Serenata, on 17th November. Serenata, which means ‘to sing in your honor’, is a beautiful collection of romantic Italian songs, perfectly suited to Alfie’s distinctive voice. With the glowing nostalgia of these hugely popular tunes, Alfie Boe not only reminds us of the extraordinary impact made in the ‘50s of these Italian numbers, songs or this music but also why Alfie he has become the biggest-selling British tenor of today. On the 23rd of May, at the New York City Center, you will see these two amazing voices singing as one. All the tickets for the “Together” Tour became available on the 20th of May. The price for the tickets for the upcoming show starts from $73 per one ticket. Don’t wait anymore and go ahead for tickets now!